Open Internet standards are the cornerstone of the Internet’s success. They enable its existence, facilitate its growth, and provide a platform that supports creativity, as well as social and economic opportunity for its billions of users. Open standards are implemented around the world in all kinds of Internet products and services. 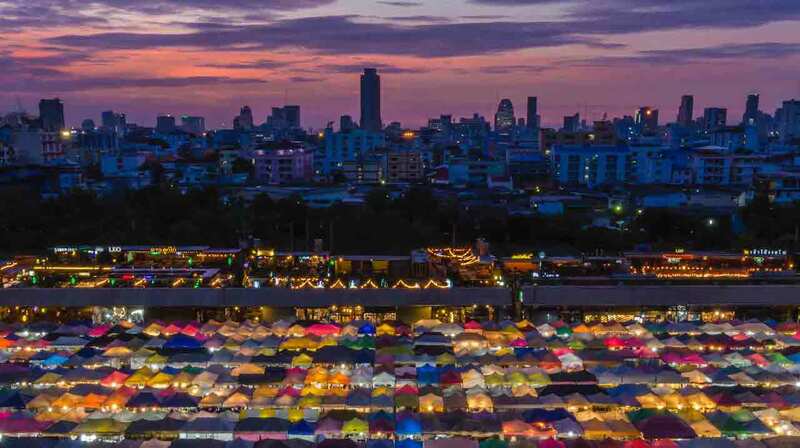 For example, they can connect people using an enterprise server in Singapore to people logged on via a solar-powered wireless network in Malawi. Internet standards – agreed-upon technical specifications that underpin the infrastructure of the Internet – are building blocks that enable interoperability, compatibility, and consistency across markets. As the IEEE points out, “standards also make it easier to understand and compare competing products. As standards are globally adopted and applied in many markets, they also fuel international trade.”  Open standards are publicly available and developed via processes that are transparent and open to broad participation. In contrast, proprietary standards are privately owned by one or more entities that control their distribution and access. Open standards let people and organizations set up new services and make them available across the rest of the Internet without permission. A good example of this is the World Wide Web, which was developed—without permission from anyone—by a researcher at the European Organization for Nuclear Research (CERN) in Geneva to organize and make more accessible the vast amount of Internet information. Web content is transmitted using the Hypertext Transfer Protocol (HTTP), which itself is open and free for anyone to use, and makes it possible for anyone to share a webpage or launch Web-based services without having to get permission or pay fees to do so. As a result, today’s Internet is full of interesting content developed by a wide range of sources—from school children to Facebook participants to international organizations. The Internet began as a research experiment in internetworking designed to allow different kinds of networks, each using its own proprietary set of protocols (or languages), to connect to and work with each other. The Internet Protocol (IP) is the core set of standards that facilitate information transit across multiple networks using different physical media, including copper wire, fiber optic cable, and wireless spectrum. The IP open standards also enable information to transit networking devices, such as routers and servers, made by different manufacturers. There are a broad variety of open Internet standards, including standards that facilitate email (Simple Mail Transfer Protocol (SMTP) and Internet Message Access Protocol (IMAP)), convert IP addresses into human-friendly domain names (Domain Name System (DNS)), and enable Internet-based real-time communications technologies (Voice over IP (VoIP)). And because anyone can participate in the development of open standards, the development process has benefitted from the best technical know-how and takes into account new conditions or requirements as new users come online. Simply put, new and innovative technical advances are an outcome of broad participation in open standards. Application developers can take advantage of the levels of compatibility afforded by the standards, which in turn, helps developers create new applications that might not have been previously possible. > Respectful cooperation between standards organizations, whereby each organization respects the autonomy, integrity, processes, and intellectual property rules of the others. > Adherence to principles including development through due process, broad consensus, transparent operation, balanced input, and open participation. > Collective empowerment that strives for standards that (1) are chosen and defined based on technical merit; (2) provide global interoperability, scalability, stability, and resiliency; (3) enable global competition; (4) serve as building blocks for further innovation; and (5) contribute to the creation of global communities, thereby benefiting humanity. > Availability for implementation and deployment via defined procedures to develop specifications that can be implemented under fair terms. > Voluntary adoption with success determined by the market. These principles have been assembled and articulated through the OpenStand movement. Open standards and the processes that develop them are currently challenged in a number of ways. > Proprietary approaches. Companies often implement a particular function in ways that do not build on current open standards. They might do this because no standard exists to meet their needs, because they decide to implement the same function without relying on standards for business reasons, or because they are unaware a standard exists. > Open standards process agility. Open standards processes, by definition, promote broad participation. As a result, standards might take a significant amount of time to finalize. This sometimes results in a “deploy first, standardize later (if at all)” approach to developing services or applications that nevertheless leverage core Internet standards. > Decreased flexibility in core Internet standards. The use of devices, such as firewalls and middle boxes, has increased as the Internet has grown and has resulted in only a limited portion of the original core Internet capabilities being effectively available to many Internet users. Many applications now use a small subset of Internet protocols and implement other functions in proprietary ways. These limiting subsets of functionality inhibit realization of the full potential of open Internet standards for flexible and innovative technology applications. This challenge is distinct from the individual proprietary approach because it is a response to a systemic network configuration. > Lack of sufficient government recognition. Currently, some government regulations and laws are often not able to legally reference open standards because some jurisdictions only recognize certain organizations for standard setting. 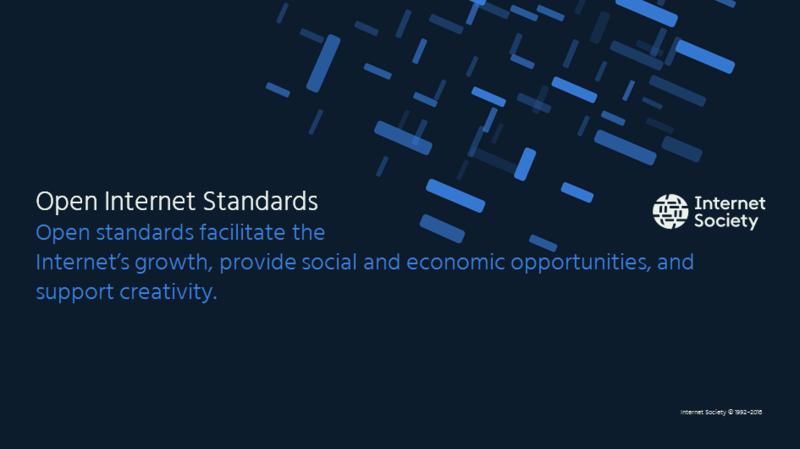 Open standards were at the core of the Internet’s past development and are key to its future growth and evolution. Open standards can be advanced in a number of key ways. > Promote broad participation in Internet standards processes. Open standards benefit from broad input and participation. This input provides the best view of the real requirements faced by diverse Internet users. Broad participation means that the best thinking can be applied to developing a solution that meets these requirements. Policymakers and other stakeholders should encourage participation in open standards activities. > Recognize open standards in government laws and regulations. Where appropriate, policy makers and regulators should reference the use of open standards so that both governments and the broader economies can benefit from the services, products, and technologies that are built on such standards. 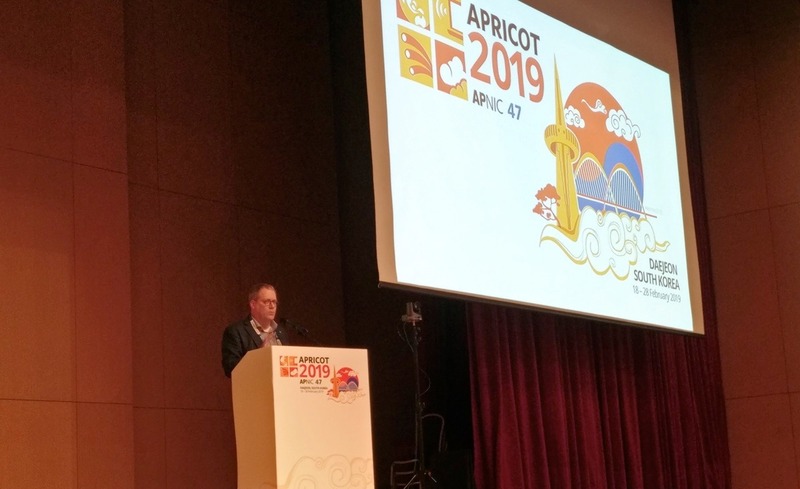 Governments should work to ensure that standards developed through open processes (including the IETF, W3C, and IEEE) are fully recognized. > Ensure consideration of solutions based on open standards as part of government procurements. Governments can support open standards by ensuring that government technology procurements are open and supportive of solutions built on open standards. Governments should identify and remove unnecessary regulatory obstacles that block the take up of open standard solutions in government procurement. > Promote awareness and encourage adoption of OpenStand principles. Governments should ensure that their standards bodies are aware of the OpenStand principles. They should also encourage the adoption of these principles in the international standards activities in which they participate. Generally speaking, open standards policy actions should encourage decision making with a sense of equity and fairness among participants based on broad consensus, transparency, and thoughtful consideration of diverse interests and viewpoints; as well as the ability for any interested and informed party to participate and contribute in the development of standards or decisions. The Internet Society has published a number of papers and additional content related to this issue. These are available for free on the Internet Society website. 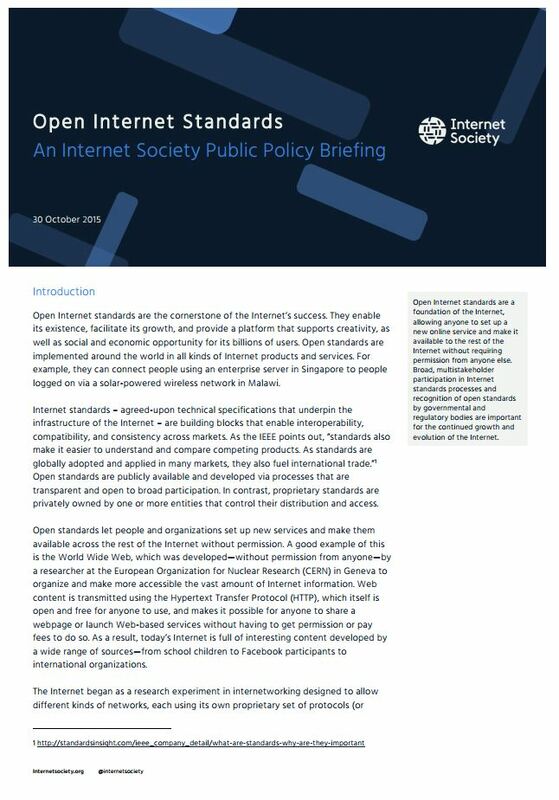 An example of the affirmation of open standards for the Internet can be found at https://open-stand.org/about-us/principles/.